An indispensable tool for beginners and experienced coil builders, this device is a must-have if you vape with rebuildable atomizers. The fully digital ohm and voltage meter by Coil Master measures atomizer resistance and voltage levels and lets you fine tune to your exact specifications. This device is not like the built-in resistance readers found in box mods and the like - they are not nearly as accurate. The Coil Master ohm and voltage meter gives you a precise measurement and displays it clearly on an OLED screen. The Coil Master ohm and voltage meter is built to accommodate both 510 and eGo atomizers. This means you can use it with virtually any atomizer. The length of the threads also lets you get a firm grip and stabilize the deck while you are working. 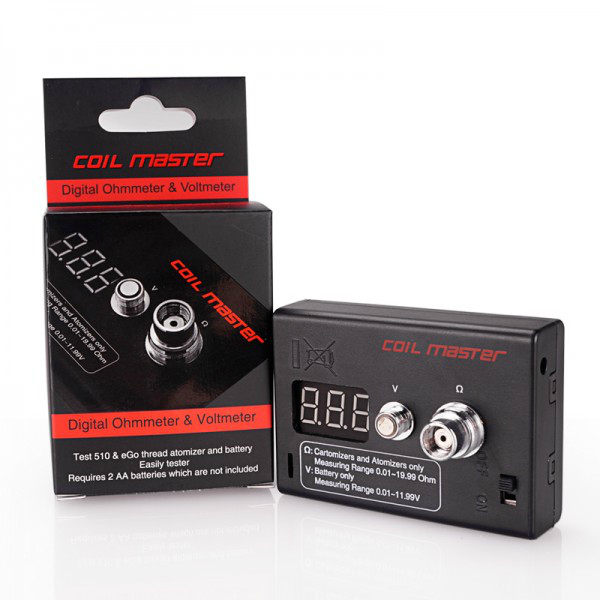 As the name suggests, the Coil Master ohm and voltage meter also reads the voltage of your battery. This is very useful because you can optimize your coil to work perfectly with your desired output voltage. This is especially useful for vapers who use mech mods matched with RBAs.